If I could choose a place to set a table at StoneGable it would be on the back corner of our wrap around porch. It’s cozy and small with such a beautiful view. I dug out one of my vintage tea sets and set a pretty little table. A little bit formal and very sweet! Let’s linger over a great cup of tea and a few scrumptious nibbles. Come ’round to the back porch and join me! 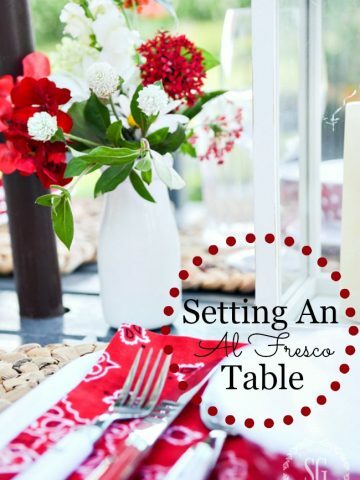 Episode #54 of Decorating Tips And Tricks is about SETTING A SUMMER TABLE. Kelly, Anita and I LOVE dishes and setting tables. 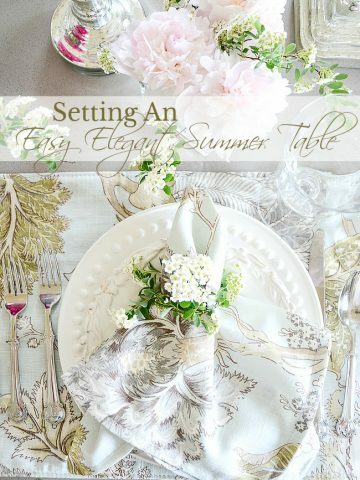 We are dishing about how to create beautiful summer tables and sharing our best tips! 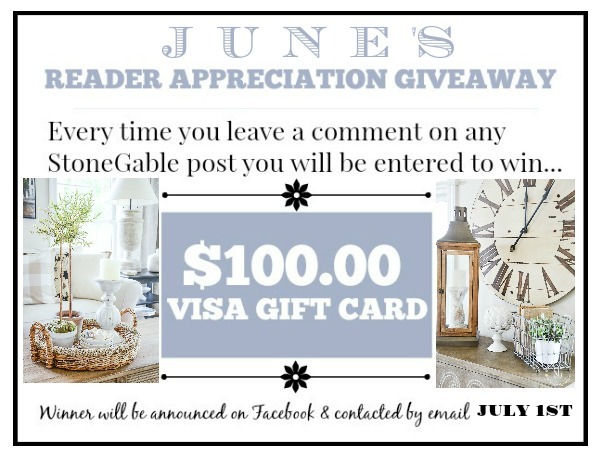 Today let’s meet at the back corner of my wrap around porch for a little tea and conversation! The table is set with one of my favorite vintage finds. 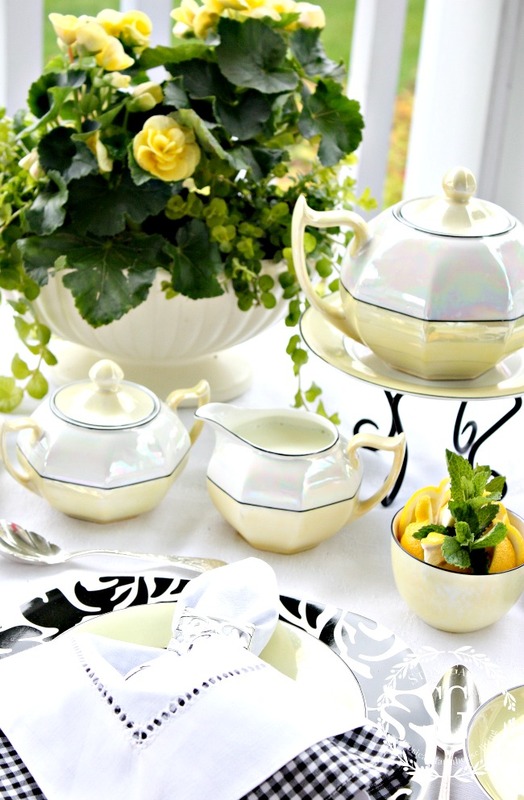 I particularly like the pretty luster of this soft lemony tea set. And the thin black rims that accent them! They remind me of something my grandmother owned. The back corner of my porch is shaded until mid afternoon and overlooks the farm beyond our property! A perfect place to have a spot of tea! The dishes were just begging to be set on a crisp white tablecloth! 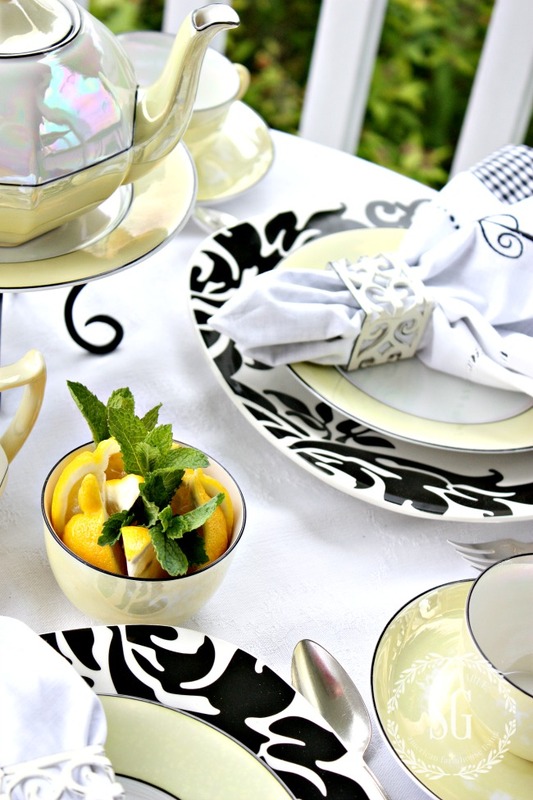 The tea set is paired with stylized square plates and black and white napkins! I love to double napkins. They are often so overlooked! 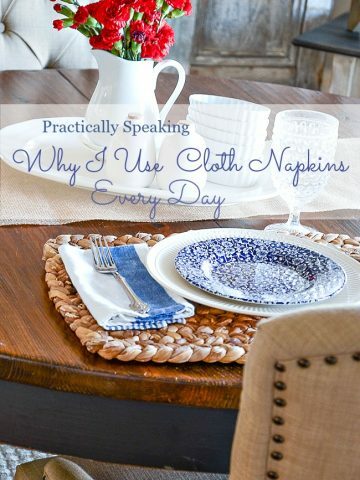 But wonderful cloth napkins are one of the joys of setting a pretty table. Make sure you have at least one set of monogrammed napkins. They will quickly become your very favorites! 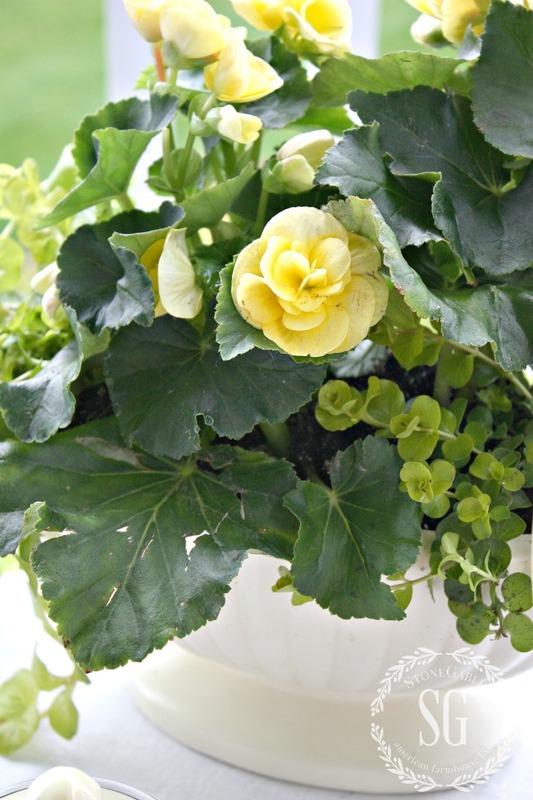 The centerpiece is a container of potted yellow begonias and creeping Jenny. So easy peasy! A warm summer afternoon with a slight breeze is the perfect way to take tea! Now, one lumps or two? LOVE that soup tureen!!!!! Where did you purchase it? It looks amazing with the flowers and greens in it. I found this flowerpot tureen at my local antique store. You have a beautiful tea set. You have inspired me to have a little tea party. I really enjoyed your tea inspiration! You mentioned getting MONOGRAMMED napkins. Do you have any suggestions as to where I might be able to find them? I do like the idea, but am not sure of good websites to start searching. Thank you so much for sharing! Your table setting, dishes and flowers are beautiful. You are so talented and the colors you choose are fresh and elegant at the same time. I really like this, and I do not normally like yellow. Perhaps because it is a pale yellow and also that it is paired with the black and white. Very nice. Thank you for sharing. I’m ready to have tea at your beautiful setting! Love your double layered napkins! That’s a new idea for me! How pretty! Love the pale yellow/white/black. You put it together JUST right! You must be reading my mind, because yesterday I decided to use yellow as an accent color in my home. I live in a really shady valley in the Appalachin Mountain Chain in NE PA. I thought with grey or white walls, yellow would make my home seem more sunny. Then today you have this article. I especially loved your tea party because my grandmother was born in England. Next time maybe you will include a tea cozy for your teapot. Everything on your table was oh so beautiful, but I just loved that you included fresh mint with the lemon slices. They look so pretty together and offer options for tea drinkers. Its been a long time since I’ve seen yellow tuberous begonias, but I think they made my day. You are my favorite blogger. May God Bless you and your family. OH, MY CAROL!!!! Thank you so much! I love that gorgeous tea set! Hope you are well! Nothing like sitting out on that porch with that view! Thanks for the refreshing post. I can imagine sitting on your porch enjoying the view. Your ideas are full of inspiration and help spark creativity in my day! Have a wonderful weekend! Absolutely stunning! I love it. I was smitten with this beautiful table setting. I don’t even like the color yellow, but absolutely LOVE this. Your attenntion to detail is remarkable. Everything perfert. I always look forward to the beautiful ideas you come up with. Yellow always speaks to me of happy times, friendship, and warmth . What a beautiful setting for creating a feeling of hospitality and love . 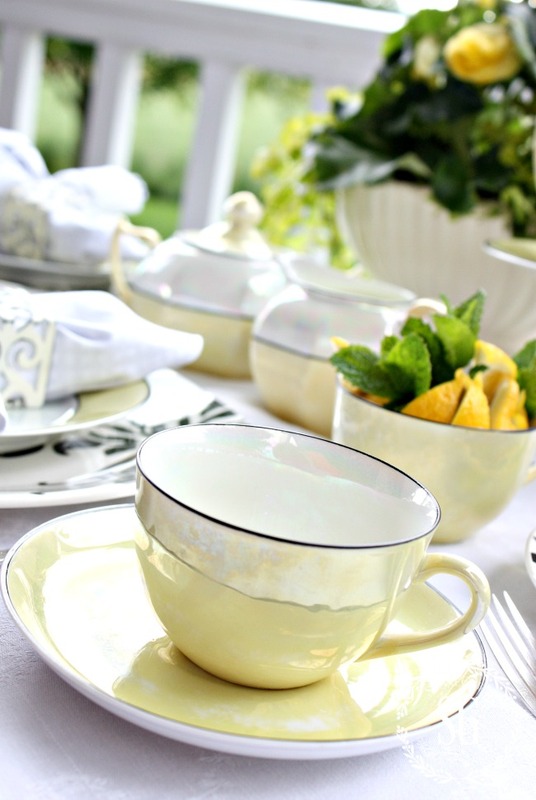 A cup of tea and a beautiful tablescape can brighten any day! My sister, friend and I are giving a baby shower tea party. I have received all the three piece tea sets from Great Britain and all are Bone China from England. Each pattern is unique and so pretty!! I like how yours is a solid color and is iridescent. One idea I got from this is to add mint to the lemons. Sadly (?!!) my daughter put in mint and its become invasive but I do know where I’ll get mint. The green of the mint makes the lemon sparkle!! I like the idea of a small flowering plant too!! It makes a striking centerpiece! I debated on ordering vintage napkins off Etsy as they were quite reasonable. I just may have to do that now!! Thank you for the pleasant tea setting. I hope you do have friends over for tea!! This has to be the prettiest tea set Imhave ever seen. The whole table decor is very inviting and begs one to just sit a spell!! Thanks for posting. I absolutely adore your lemon yellow tea set. It is beyond stunning!! Your whole tablescape is so elegant, gorgeous and inviting. Yvonne, this is so lovely! I love traditional floral tea sets, but this just takes tea in a slightly different direction. It almost looks like something from Paris, very sophisticated but welcoming too. The black accents are perfect! Thank you for sharing. I love your pretty yellow tea set and love your pretty country view. Absolutely beautiful. I just love the colors and patterns together and you have such an amazing view. I just love the photos on your blog! Ladies just love a beautiful tea party and tablescape! I got my husband to go to the Empress Hotel in Victoria, BC for tea with me. He was very “taken” with the entire experience. To assist those looking for monogrammed napkins, there are many sources, but I think I ordered mine from Horchow. They make wonderful wedding gifts…you know how brides love to show off their new initials!!! Lovely setting for relaxation. Thanks for sharing. The table setting is so pretty!!!! Such a great way to have a cup of tea. 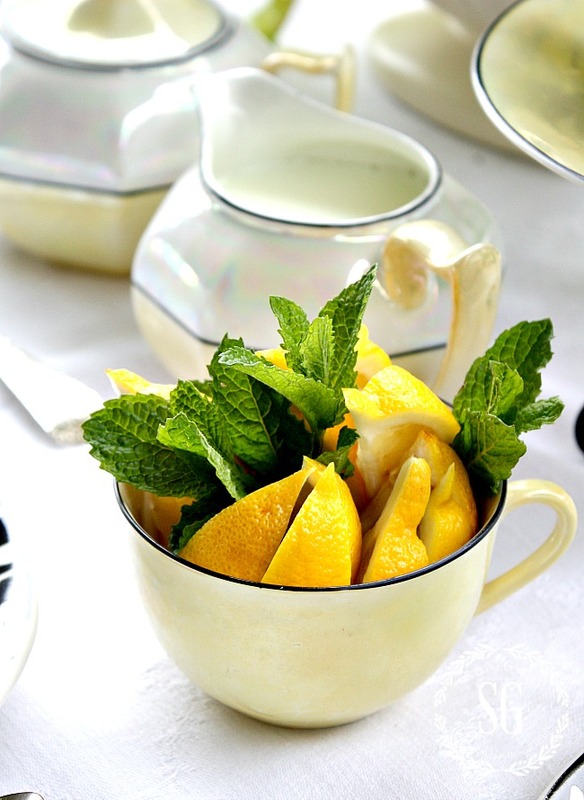 Love your tea table…you have the right touch with even the simplistic touch of adding mint to the lemon slices! Wish I were there. One lump, please, Yvonne. So pretty and crisp! There is something about black, white and yellow that just works! Beautiful job and photography. Beautiful Yvonne! 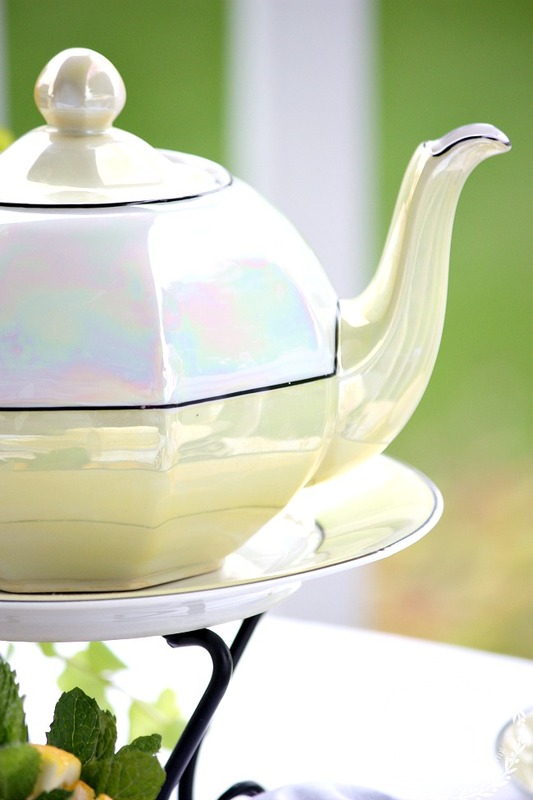 I love the soft yellow of the tea set and that iridescent shimmer! Just stunning with the black and white plates and napkins and the greenery of the plant. How relaxing it would be to sit on your porch with the beautiful table setting and the beautiful background. Just beautiful! I love the color lemon and the flavor, too! Give me lemon meringue pie and I am in heaven. In the 1979 film called “My Brilliant Career”, which is about a very independent young woman writer, she is to go to a ball and the women are asking what color gown she would like. Blue, pink? No. She says with a twinkle in her eye. “Lemon”! It fits her so perfectly and it looks ravishing with her long wavy red hair! Lemon is always fresh and somewhat unexpected. Love the yellow and black together! Love it! Good afternoon Yvonne,your wrap around porch nook is so inviting. Who wouldn’t want to sit down and have a relaxing afternoon tea, you make your porch look so lovely. I love your adorable little tea pot set. It reminds me of my grandma’s set that she use to have. Beautiful, absolutely lovely. How I loved to enjoy a cup of tea with my mother. What a gift those times were. 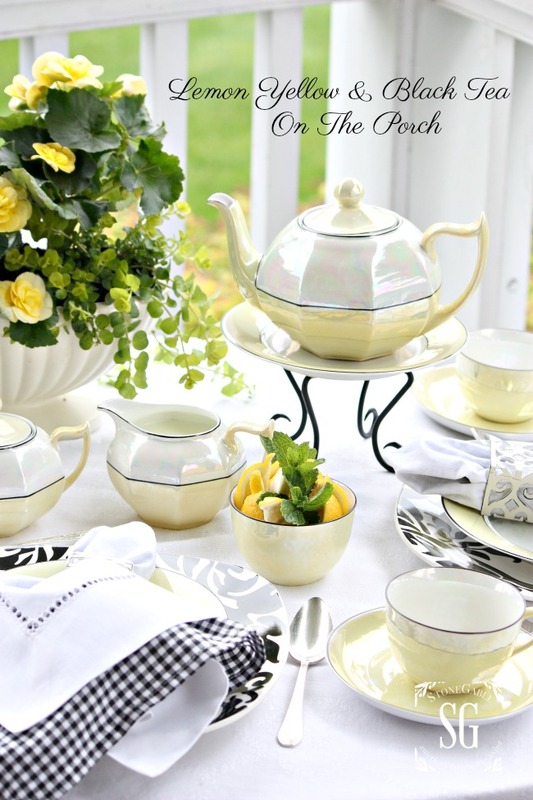 Love the vintage yellow tea set! Has to be the sweetest tea set I’ve ever seen! I love the combination of yellow and black–so often the yellow is so bright that the two colors fight with each other, but this is just right. Love all your posts! This is so pretty!! Beautiful. I love what the color yellow brings to a table. This is so welcoming and just my “cup of tea”. 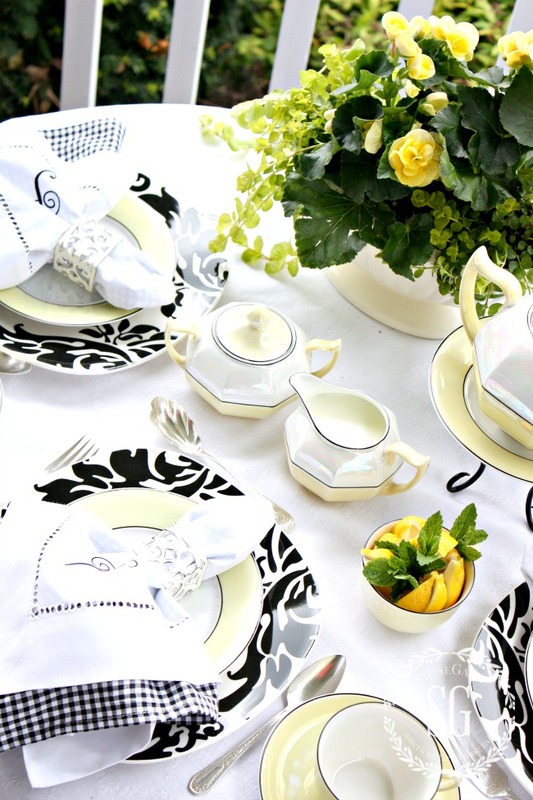 The yellow tea set and flowers with the black and white accents-perfect! Love the view and the gorgeous dishes. Love your pretty table. I have black and white dishes that I seldom use because I think they are too formal. Will get them out and use them. Thanks for sharing. The view, the porch, the table setting,aaaahhhhhhh,so lovely. So beautiful. 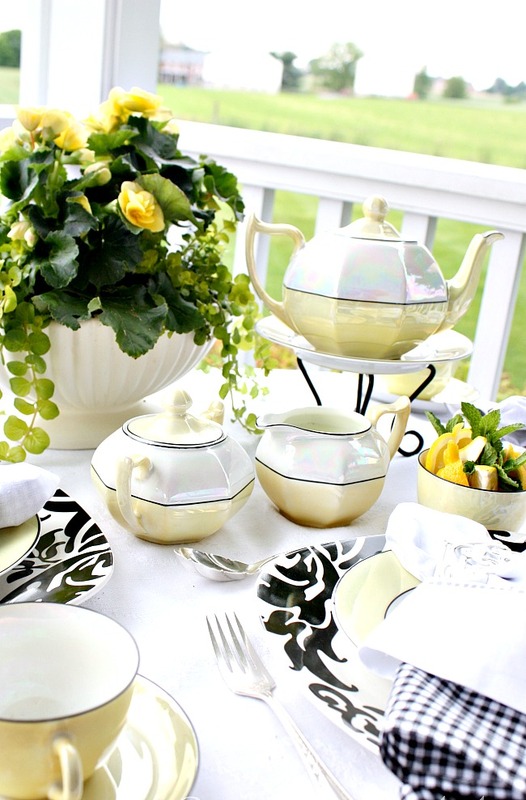 Love the yellow and black, delicate tea set. And the view, well perfect. The napkin idea is great. Thanks for sharing tea on your porch. This is the most beautiful tea service I’ve ever seen! And, OMG, the way you’ve styled it is beyond gorgeous! Now I’m gonna be looking for a fabulous tea set! I don’t think that will be easy because of breakage over the years! Thanks, Yvonne, for the love!!! I would love to have a porch. I do not really like tea or coffee so it would have to be cherry coke. Since I’m all about tea sets and inviting table settings, this post brought great joy to my heart! You should open a tea room, or even better your porch! This would be a dream to sip tea with you. The setting is so restful. I love yellow with black and white. I need to double napkins–so formal, yet casual. Your tea set reminds me of my grandmother’s. I’m off today to look for black and white checkered napkins. One word GORGEOUS! I love the colors and the tea set. Where do you store all your beautiful dishes, linens and accessories? I would so enjoy a cup of tea with you. The table setting is so inviting. You gave me a wonderful idea to have napkins Mammogram for my friend’s birthday. Her dining table is always set and ready for guests. Have a bless day? What a beautiful gift, Donna! This setting is just beautiful! I love your beautiful table setting! The view from your lovely porch brought back memories of the trip to Lancaster County I enjoyed with my husband a few years ago. My ancestors settled there in the early 1700’s. The lush green landscape, fireflies at night, and the history of the area fill my memory cup. Love the tea set. 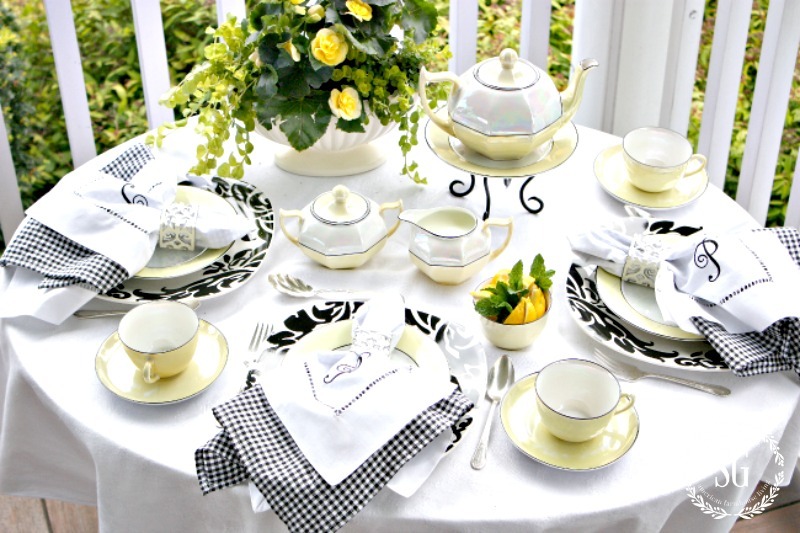 The pale yellow with just a hint of black looks so pretty with the rest of your table setting. Elegant, beautifully inviting, soft and feminine yet just enough edge with the black touches. Centerpiece gorgeous. I love the idea of double napkins! You should submit your afternoon tea idea to TEA TIME MAGAZINE. I love the black and yellow. Such a lovely table setting. tea is my favorite time each and every day! love tea sets too! What a lovely spot to sit, relax and have a cup of tea! Your tablescapes are always so inspirational, I learn so much from your blog! Thank you for sharing with us, your readers love you! Hope you are feeling well? Oh my gosh this is so beautiful! I could sit there all day! I love the dishes and tea set, the colors are fantastic! I love black and white with either yellow or a bright green, some of my favorite color combinations! I pinned a couple of pictures, too beautiful not to remember this. The yellow is lovely with your black and white! 1. What is the teapot setting on? Details, please. 2. Is creeping jenny evasive? Tell me more about this plant. Delighted that you used the mint, it is SSSSSsss oooooooooooooo overlooked. Having it on your post, being the leader that you are, will put it front and center. I am a lover of tea, and beautiful dishes. I have several sets of dishes, but am having trouble finding napkins that I love. 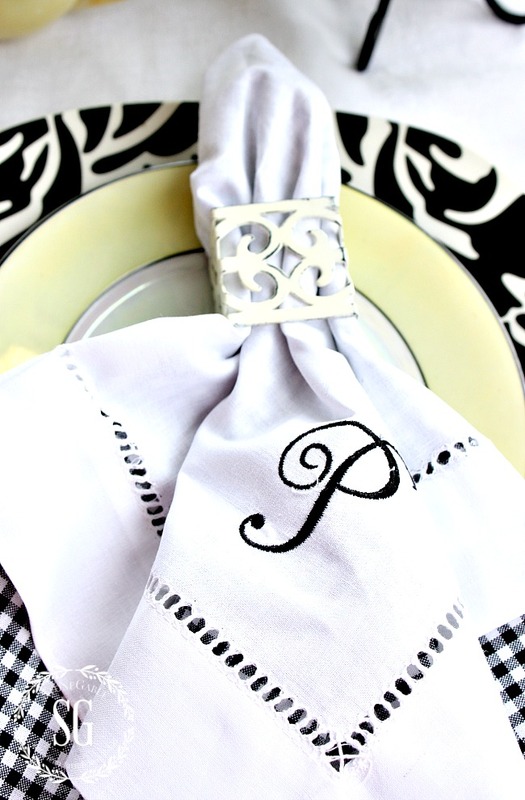 Can you tell me where you got these black and white napkins? Yvonne, this is the prettiest table setting I’ve ever seen! Usually, tea sets are more or less the same, but this set is breathtaking with the thin black rim and the palest yellow. I’m going to copy your use of double napkins and I’m ashamed to say I never thought of getting mine monogrammed. I will now though. This table setting is perfect! Thank you for the inspiration! When my family or guests give me a compliment, it’s often on something you have inspired me to do. Stunning. You have the most beautiful dishes and tablescape. Thanks for sharing. I love the yellow dishes. I am ready to join you for tea. Oh my, this is so pretty. I’m loving the lemon and black together … fresh and fun! I assume the monogrammed napkins are from Pottery Barn? Such a pleasant spot. I would want to spend a lot of time there too. Your tea set is so lovely and I quite adore the monogrammed napkins, which I have none of yet. Thanks for more inspiration. Gorgeous…I love the yellow serving pieces, but the black and white plates really set the yellow them off! You have a true eye for decorating, for me, I have to work at it like studying. In fact, I feel like I spend hours analyzing a new pottery barn catalogue when one arrives in the mail! Good for you Melissa! That is the way to develop a good designer eye! Oh my gosh, this table setting looks gorgeous! The tea set is beautiful! So elegant and inviting. I just returned from London and had the opportunity to enjoy a proper English High Tea. Such a wonderful way to spend an afternoon, I wish we had tea rooms in NJ, but your table inspired me. Thank you for brightening up my morning with your post. You can create a high tea in your home, Susan! I lived in England when I was a child. So beautiful and the yellow,black and whites colors together are gorgeous. I would love to join you for tea! What a wonderful way to celebrate a lovely afternoon with friends or family. I love that tea set. And the matching flowers make it perfect. 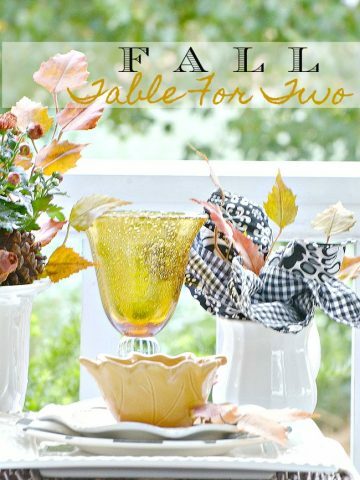 I love yellow & black together & your table looks perfect! 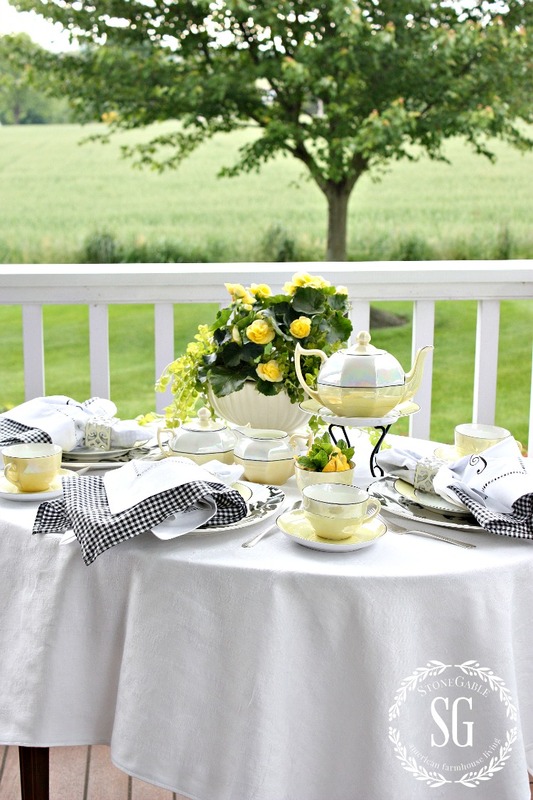 The perfect teatime setting for a summer outdoor garden afternoon teatime, Yvonne. Yours is a perfectly appointed tablescape, ma’am. Delightful tea setting! Looks inviting, can we come? That vintage find is a treasure. Oh this setting looks SO inviting. 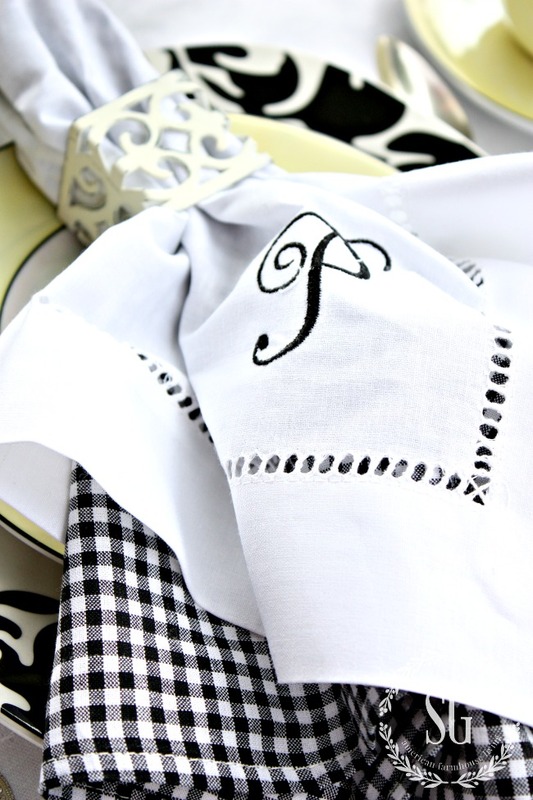 Monogrammed napkins on my to do list! Yvonne, you always set the most beautiful tables. Everything is wonderful. Thanks for sharing, enjoy! This is one of my favorite table settings of yours. I would be very happy to bring delicious lavender scones. Beautiful! I am now on the hunt for monogrammed napkins . Beautiful dishes and beautiful table – thanks for sharing. 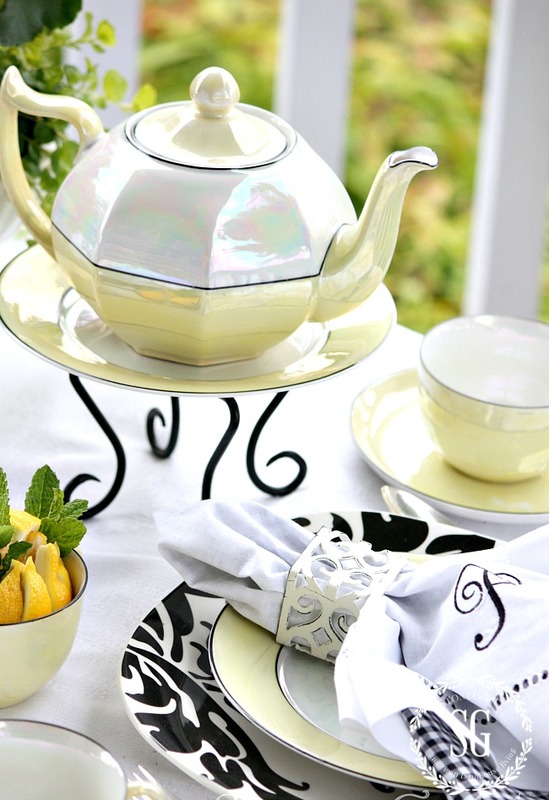 Very beautiful tea setting.Love the yellow and black and white together.It looks so warm and inviting. How very lovely and inviting! Love the tea set & the monogrammed napkins! Beautiful!! Beautiful! I could sit on that porch all day! Beautiful setting, I would even like that on a rainy afternoon. So pretty. Some lemon verbena shortbread cookies with the tea would be just right. I envy you your beautiful porch Yvonne. Enjoy the summer. I love the napkins and the whole setting. Now I want to make make new napkins. I love the black and white check. The color of the yellow just sets off the display. I will have tea with you anytime. Beautiful! 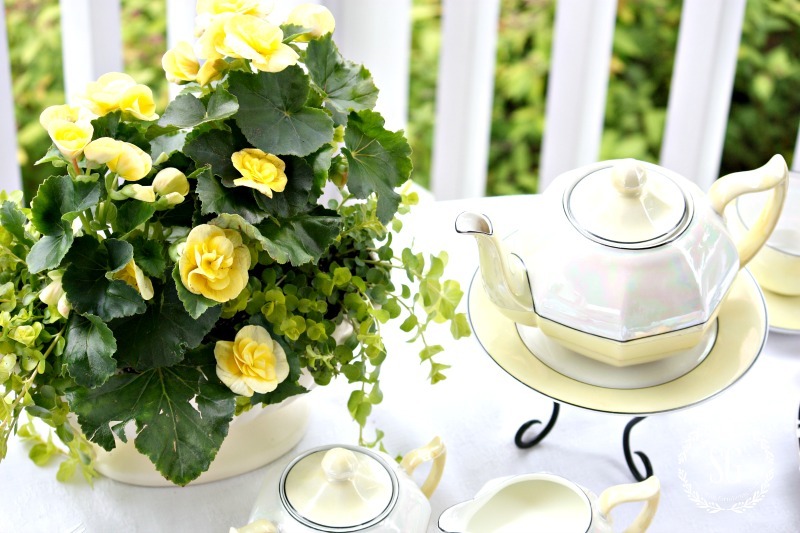 Love the tea set in delicate yellow. Who wouldn’t want to be invited? Would love a wrap around porch. I love the pale yellow teapot. Beautiful setting. Everything looks so beautiful and relaxing. I love that tea set!